​Jesus replied: “‘Love the Lord your God with all your heart and with all your soul and with all your mind.’ This is the first and greatest commandment. When the Pharasees asked Jesus about which was the greatest commandment, they weren’t asking because they didn’t know, they were asking to try to trip Jesus up. The issue became less about what they asked and more about their motive and their heart. Today, when we read this exchange between Jesus and the spiritual leaders of his day, the question we typically ask is “who is my neighbor?” Which all too often really means, “who do I have to love?” And for us also, the issue becomes less about what we ask and more about our motive and our heart. aren’t we also labeling “who isn’t” our neighbor? those I have to love and those I don’t? Now, I really want y’all to understand that this is NOT being written from atop my soapbox; oh no. This is coming from a low place of conviction, my fingers are typing but my toes are bruised. It’s easier to love the idea of loving people, than to actually love other people. It’s easy to love the neighbors who are like me. It’s easy to love the neighbors where I want to go. It’s easy to love the neighbors inside my comfort zone. It’s easy to love the neighbors who agree with me. But loving others isn’t about them, where they are or who they are - it’s about me, it’s about who I am – a child of God – and where I am – in my relationship with Christ. ​So the real question is NOT “who is my neighbor” but: What must I DO to BE a neighbor? ​In Luke 10:25-37, Jesus is asked again about the greatest commandment and this time he gives us the parable of the good Samaritan and answers our question – what must I do to be a neighbor? ​31 A priest happened to be going down the same road, and when he saw the man, he passed by on the other side. Am I so consumed by my own needs that I become oblivious to the needs of others? Am I losing sight of those I am ministering to as I am trying to maintain my ministry? ​32 So too, a Levite, when he came to the place and saw him, passed by on the other side. Am I becoming an expert about reading people without ever reaching people? Am I praying for ‘someone’ to come meet the need and not actually meeting the need myself? It’s easy to live as if Christianity is just coming to church to fill me up and not worry about anybody else. It’s easy to say I love others, and just walk right past the hurting assuming someone else will meet the need. 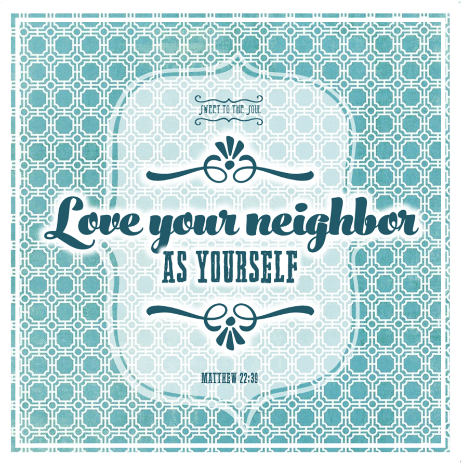 It’s easy to NOT be a neighbor, because loving our neighbors as ourselves, demands sacrifice. ​I would love to hear from you. How has someone been a neighbor to you? How has God led you to be a neighbor to someone? Join the conversation below in the comments. ​This post is part of the series Blogging Through The Bible with the Good Morning Girls [Matthew]. To follow along please visit GoodMorningGirls.org. I'm also linked up with Holly Barrett for Testimony Tuesday. Ouch, ouch, ouch! I taught on this in a series this spring with "typing fingers" (or "tripping tongue") and "bruised toes." I think I'll just get up and read this and say, "Did y'all get this?" There are so many good quotes here. I love your heartcheck on the Samaritan. And on "reading people without reaching people." I have to say, there are some really beautiful, inspirational blogs out there. This one is convicting. I can teach, I can write, I can lead. But what am I DOING? How am I showing love? I'm saving this. Thank you for that support Angela. God is so faithful to feed me from His word if I will just go to Him. It's not always what I want to hear, but I know I need it. Blessings friend! I love the heart check questions Jana! They are perfect for self-reflection! oh yes, for me too! Jana, I so enjoyed printing this and going through it more slowly at home last night. As I studied I saw that a key word in the story of the Good Samaritan was speaking to my heart. COMPASSION. God wants us to SEE and have compassion. That compassion prompts our actions. It prompts us to go and do likewise! Thank you for sharing and helping me deepen my bible study time! Oh yes - compassion. So important. Thank you for sharing this with your Bible study group today! You welcome! I think they enjoyed it and I pray it spoke to their hearts the way it did to mine! The heart check questions were my favorite too Irene! I too love the "heart check". It makes me pause and quiet myself before the Lord. I recognize the times I have "helped " someone with my religious agenda verses the times when my heart is overcome with compassion. Thanks for sharing, I really needed this today!!! We had a neighbor yesterday who posted a prayer and some praises about straight line winds that took out 3 very old cedar trees, thier propane tank but left their house and vehicles untouched, When I mentioned it to my husband his immediate answer was %u201CDo they need help?%u201D a normal request of him but he is still recovering from a severe respiratory infection and it was cool and very windy out and me recovering from surgery and the same virus. We bundled up, headed the 15 miles over and were able to clear the path and area around the propane tank. Many knew the need but God used us to fill it. It was hard, Bill needed to rest to get his breath but God gave him the strength to get what was needed done and they have heat today because, despite how he felt, my sweet husband went when called. We each can help one and in doing so all will be helped and that help can not be based on how we have been helped but how God calls us to help.